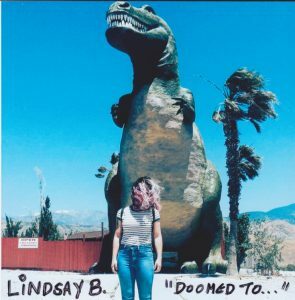 Lindsay B, a solo artist by the name of Lindsay Baffo, is a musician from LA who creates infectious garage power-pop. For Baffo, this isn’t her first musical project. She had two bands prior to this, however, she decided to go solo after a friend suggested that she go by her name as a solo act, because she wrote all the songs for her previous bands. “At the time, I didn’t really want to brand myself as a singer-songwriter because I used to think it was a little corny, but after a couple years, it was something I began to think differently about. I was more comfortable with taking creative ownership, not hiding behind a band name,“ said Baffo. Music had always been part of Baffo’s life and because she dealt with a lot of trauma in her childhood, listening to music was her therapy. Music, in general, has helped Baffo in dealing with anxiety and relating with others in her life, which she sometimes finds to be difficult. “My songs are the only way I feel I can share things about myself without worrying about what the other person in front of me is thinking because I live in my thoughts too much,” shared Baffo. Her debut album DOOMED TO . . . was released in June of this year, and is filled with energetic anthemic rock songs with loud guitars and angsty lyrics. It is one of those records that sounds best with the windows down, driving on the highway. Differentiating from her earlier bands, Baffo says that she was less concerned with live shows. Because of serious anxiety, while performing in front of people, she finds herself most comfortable in the studio, focusing on songwriting and experimenting with production. Baffo minimized outside influencers during the recording of the album and worked with Jesse Avila, who plays bass on the record and produced it. He shared similar sensibilities with Baffo when it came to recording and maintaining sonic clarity. “He’s a genius and one of the most talented, hardworking artists I know,” said Baffo. The decision to call the album DOOMED TO . . . was made only a few weeks before its June release. The album was initially titled, In the Backseat of Your Car, which was a lyric from the song, “Nobody’s Waiting.” The title, however, changed because the meaning of the record evolved over time. “Driving” is an album highlight that Baffo penned at 3 a.m. while driving the 101 freeway. “It was just me and the stars and the lights of LA. Nothing else existed. I rolled down all the windows and was screaming and laughing and crying and kind of started writing the song right there on the 101/110 freeway interchange. It was something cosmic. When I got home, it all poured out of me in a span of 10 minutes,” said Baffo. When it comes to writing songs, Baffo does not have any specific method of songwriting and doesn’t try to force anything; some songs can take months to write while others take only 15 minutes. She also doesn’t think much of outside opinions and just creates music. “It’s totally amazing if people listen to my music or even like it, but I don’t think about it that much. I’m lucky that my family and friends are interested in my art, but I don’t really talk about it unless people ask,” explained Baffo. Inspiration-wise, Baffo says she couldn’t name all her influences, but musician Kim Deal has been a big inspiration since she was 16 and admired how she reinvented herself with each Breeder’s record and her style in general. “She’s so effortlessly cool. Like the whole ‘no makeup, oversized t-shirt, borderline androgynous’ cool that I aspire to be,” said Baffo. Living in LA, Baffo draws inspiration from the city and says that it is a living, breathing counterpart to her life.